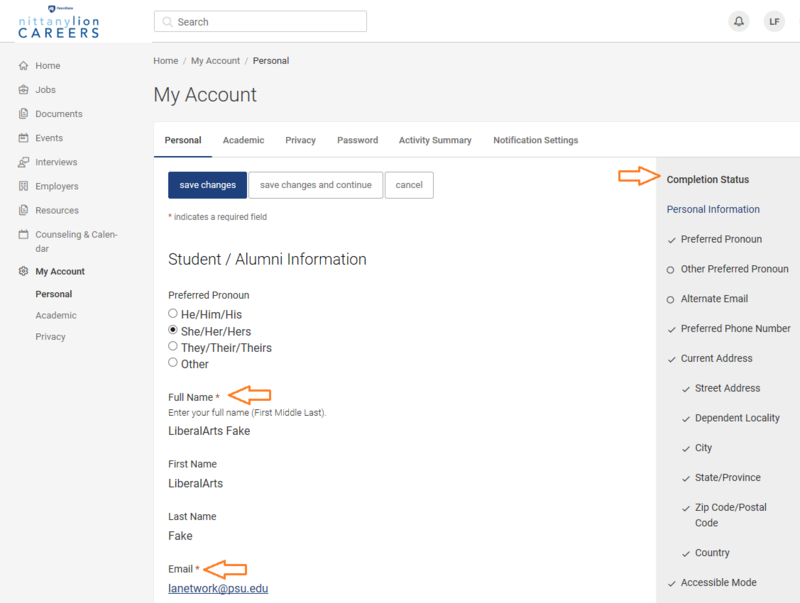 Nittany Lion Careers is linked to LionPATH; many fields within your Nittany Lion Careers account are automatically filled in using your student information from LionPATH. 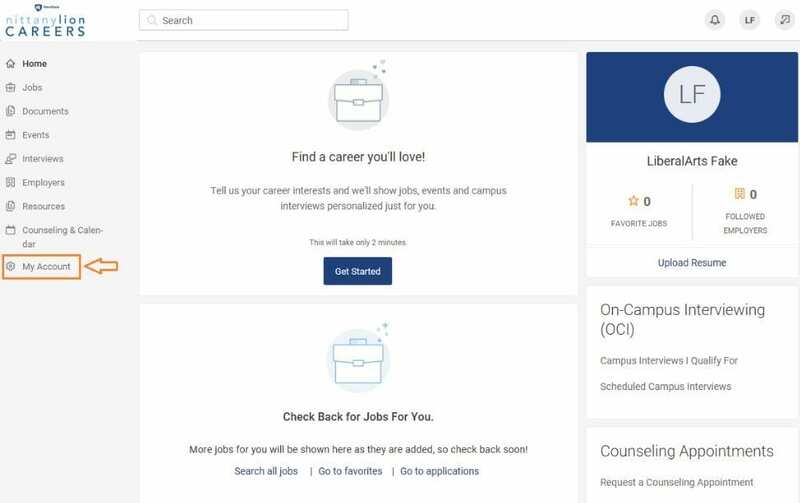 Pre-filled information from LionPATH must be updated through LionPATH – new or updated information from LionPATH is transferred to Nittany Lion Careers at the end of each day. Some fields are not pre-filled and need to be periodically re-updated by you. 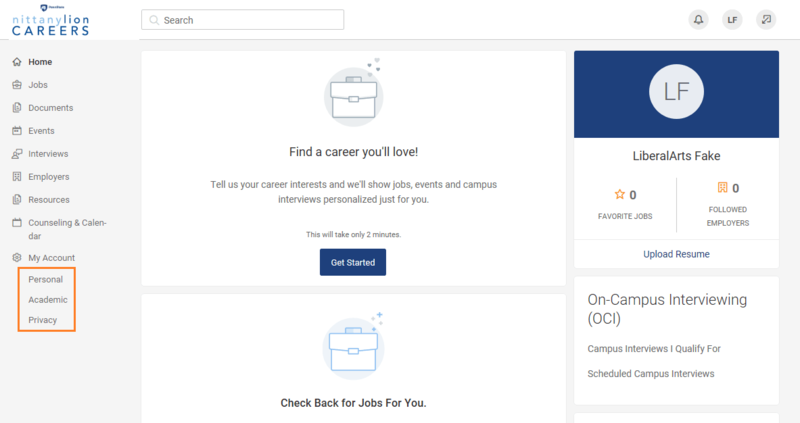 To view your Nittany Lion Careers account information, click “My Account” on the sidebar of your home screen. Several categories for types of account information will become visible underneath “My Account.” Click on each category to view and change information related to that category. Before making counseling appointments or searching for jobs, you will be prompted to add required personal and academic information and accept the system use agreements. Required fields are indicated with a red asterisk. You can track your progress with the completion bar along the right side of the page. 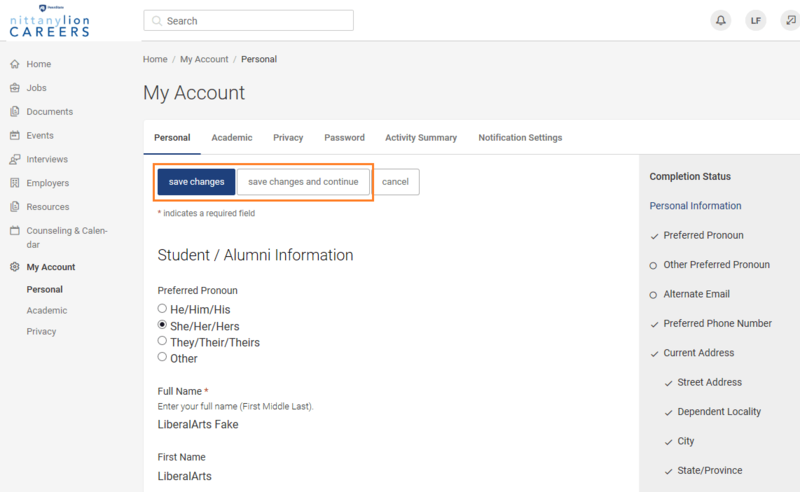 Once you have finished updating the information within a section, click “Save changes” to save or “Save changes and continue” to save and move on to the next information category. Once you fill in the required fields and any additional information you would like to provide, you are ready to start using your account to search for events, apply for internships, and schedule counseling appointments! It is good practice to review your account information at least once a semester to ensure that it is up to date.